Luang Por Lae Tidtappo of Wat Pra Song in Petchburi, was a direct Looksit apprenticed in Dhamma and Sorcery to two of the Greatest Masters of Olden Days, the legendary Luang Por Tong Sukh of Wat Tanode Luang, and Luang Por Plern of Wat Nong Mai Luang. Luang Por Lae was born in the year 2459 on the 19th June, in Tambon Rai Makham in Ban Lard, Petchburi Province. He was ordained into the Buddhist Sangha at the age of almost 20 Years old on the 24th of May 2499. Luang Por Plern Wat Nong Mai Luang, Luang Por Tong Sukh, Wat Tanode Luang, who taught him to perform Wicha Sak Yant Kroo, which was the most powerful Yant in his particular Magical Dtamra, namely the Yant Hua Jai Pra Ram (Heart of Rama Yantra), which controls the powers of all other Yant which are tattooed thereafter on the devotee, including the Ling Lom Vanora, Hanuman, Gold and Silver Hongsa Swans. Luang Por Chit of Wat Mahatat, taught him the adept levels of Wicha Horasart (Astrology and Fortune Telling), and it is said that Luang Por Lae attained the 6th sense in this Wicha, and was able to foresee future events. Luang Por Soke of Wat Pak Klong in Ban Laem taught Luang Por Lae the Wicha Pra Khan (Sceptre, Ritual Dagger and Wands Magic). Luang Por Pan of Wat Mahatat Voravihanr taught Luang Por Lae the Wicha of Takrut Tone and Takrut Faed amulets. 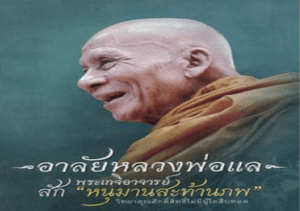 He was taught the Wicha Sak Yant Maha Maekh from Luang Por Dtor and Kun Por Jantr of Wat Khao Wang in Petchburi, and after their passing, for a long time, Luang Por Lae remained the only Monk able to perform this Wicha. In the year 2489, an event happened that caused Luang Por Lae to recieve a shock, as he was staying at Wat Maha Tat, where some terrible news about his family home had been broken into by marauders, who killed his mother and siblings (his father had already passed away beforehand). The only thing left in the home was a piece of gold weighint 100 Grams which the thieves had dropped as they fled the house, which Luang Por Lae had to use to cash in to pay for the funerals of his mother and siblings. Because of this sad event, Luang Por Lae decided to go and practice Tudong solitary forest wandering on foot, throughout the land. He decided to do this in order to master powerful Wicha, in order to be able to help people in future to prevent such terrible events from happening, and to be able to perform magical miracles to protect people from being harmed, as his own family had been. He wandered through the then still wild and undeveloped areas between Petchburi and reached as far as Nakorn Pathom province on foot, and met with and practiced many forms of Wicha with various great Masters of that time, in particular, the Wicha Kala ta Diaw Rahu Om Jantr (one eyed coconut Pra Rahu Maha Ud Gunstopper spell), and the Wicha Serm Duang karma Improver spell of Luang Por Chaem, of Wat Ta Gong. He then Mastered the Wicha Na Hnaa Tong Golden faced Lakshman gold leaf forehead blessing from the Great Luang Por Te of Wat Sam Ngam, the Wicha Pong Jinda manee, and Wicha Bia Gae Cowrie Shell amulet making spell from Luang Por Bun of Wat Klang Bang Gaew. After this, he travelled onwards to Samutr Sakorn, and Mastered further Wicha; Wicha Choo Chok with Luang Phu Rod of Wat Bang Nam Won, and the Wicha Takrut Mai Phai (bamboo Takrut). As Luang Por Lae approached Bangkok, he passed by Tonburi, and furthered his Wicha Bia Gae with Luang Phu Rod of Wat Nai Rong, in Taling Chan Municipality. Then he travelled even further into the Province of Ayuttaya, and learned the Wicha Takrut Puang, and the Wicha of the Yant Hua Jai Pla Tapian Maha Lap from the Great Luang Por Jong of Wat Na Tang Nork. And even further on he travelled Northwards to Nakorn Sawan, to Master the Wicha Sastra Mitmor Ritual Knife making, with the Legendary Luang Por Derm, of Wat Nong Po. Then he travelled back Eastwards, to learn the Wicha Palad Khik with his Kroo Ba Ajarn Luang Por Ee, of Wat Sattaheeb. Luang Por Lae then went back to Petchburi and used his Wicha to help the Local Devotees, and later became Abbot of Wat Pra Song. Luang Por Lae passed away in the Year 2551 BE on the 10th March, at the age of 92 years old.